Hello Spring – we look forward to beautiful weather, including lots and lots of rain as it has been incredibly dry since Christmas in Mudgee and in so many country towns in NSW. Lambing is well underway with several poddy lambs to help feed each day. Pssssst Last year’s poddy lambs still enjoy a bottle or two as well lol. Eggs galore to collect and enjoy – on a farm it often seems to be either a feast or a famine and we are really enjoying our feast of beautiful fresh eggs every day. Our exciting news this month is the start of painting the outside of our Train Carriage, in it’s original colours. We thank Rob Marlow for taking on this huge challenge – we anticipate a great job by him. Don’t worry everyone – we are still operating our Train Carriage for our farmstay guests 4 nights a week and 5 nights a week during school holidays. All the preparation work and painting will be done in between farmstay guests. “Gus” was given to us in November last year with all four of his hooves fly blown and a major infection in one of his legs. Although we were always hopeful, we really didn’t expect “Gus” to survive. 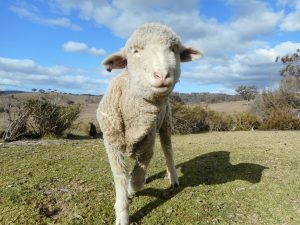 “Gus” however has the biggest heart and determination that I have ever seen in a Merino Sheep. 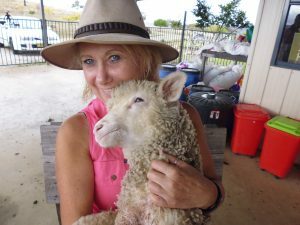 After loads of antibiotics and his leg dressed with Manuka Honey and then lovingly bandaged each day by Kate – we can now safely say that “Gus” is a very healthy Merino Wether who will enjoy a long and happy life at Ba Mack Farmstay. The only thing that makes “Gus” look any different from all our other pet sheep is his inability to use all four of his legs. “Gus” however has very cleverly learnt to use just three of his legs as the fourth lost muscle control from the infection. “Gus” has become a loving part of our family and we wouldn’t be without him – everyone who visits us loves his gentle nature and to this day he still lines up and thoroughly enjoys several bottles of milk each morning as well as a full life of grazing in our house yard.